The true formation of Battlecross came about in 2007. With a mixture of mature and technical riffs and energetic live shows, Battlecross’ music was soon described as “Blue Collar Thrash Metal” due to their hard working attitude. They have toured with bands such as GWAR and DevilDriver, as well as being featured on local, national and global metal radios, amongst other feats. 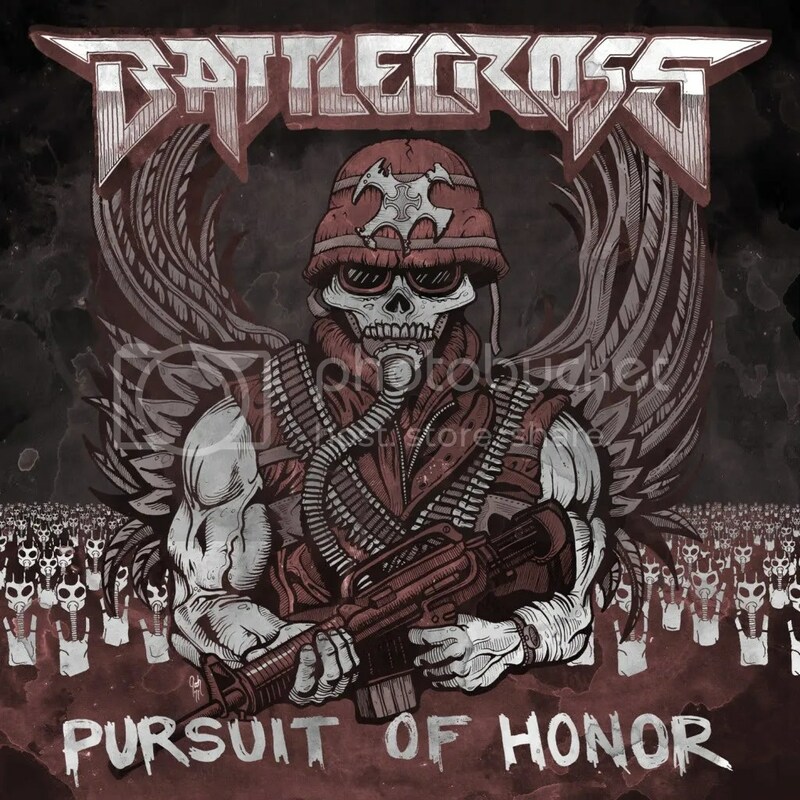 Following the release of their recent album, “Pursuit Of Honor”, it seems nothing is going to stop Battlecross. The title track, “Pursuit Of Honor”, leaves the listener thinking ‘what the f**k is this?’ as it entirely composed of a short acoustic guitar medley. Fortunately, the next song “Push Pull Destroy” shreds its way next with a violent intro riff. The drum work is terrifyingly brutal, whilst the vocals are raw, angsty and bloodthirsty. The riffs are slightly technical in their playing and composition, however they favour a straight forward metal assault over the fancy technicalities – Until the song nears it end anyway. The guitar solo is a true display of talent and fits in nicely with the rest of the song. “Kaleb” starts with a slight death metal element to it, boosting the levels of brutality slightly more. The music, does however, show influences of thrash metal. The melodic sections work well with the savagery of the vocals and the barbaric sound of the drums. ”Deception” is another track with a brutalising and heavy introduction, though this one seems to favour its punch over its melodic riffs. Double bass is used heavily throughout the song, being used in every section of the track. There is use of melodic riffs in the second half of the track though not as heavily used as the other riffs. The solo-like introduction of “Man Of Stone” comes next before a thrash-death metal assault begins. The track becomes more thrashy as it progresses, increasing in violence as well. The vocals are full of raw aggression and power, bordering on the line of being psychotic sounding. “Breaking You” as a not so enjoyable introduction, though the vocals soon make up for it. The drums are full of violence but intelligently played as well, making the track sound ever more murderous. The riffs, for the most part, are well composed and played. Following after is “Rupture” with an intro slightly familiar to that of “Breaking You” but it soon changes as the riffs turn slightly more melodic. The lyrics are grim and vicious, which is to be expected – Though the lyrics don’t sound to be for the faint of heart. Nor do the guitar riffs for that matter. “Leech”, though being heavy, seems laid back compared to the previous tracks. The track seems to be lacking energy and a bit of passion. “Better Off Dead” comes shredding its way next, bringing back the brutal riffs, energy and passion. The vocals are bloodthirsty and immense sounding, dominating the track massively. The riffs are masterfully played and the drums keep the track together. “Misery” is more slow paced yet more passionate and aggressive compared to some of the previous tracks. The tempo does increase however before the vocals make themselves heard. The riffs are face-meltingly good and the drums are savage and barbaric. The album finishes with “Foreshadowing” which sounds oddly Gothic, which is a strange way to end the album. Even the solo sounds somewhat Gothic. It’s no wonder Battlecross have done so well in their career. The band is made up for musicial genius’ and talented musicians. “Pursuit Of Honor” is perhaps one of the best albums on the modern thrash metal scene. Battlecross could easily replace one of the top 4 of thrash metal if they keep producing albums like this one. This entry was posted on 1st September 2011 at 4:10 pm and is filed under CD, Metal with tags Battlecross, Better Off Dead, Death Metal, DevilDriver, GWAR, Metal Blade Records, Pursuit Of Honour, Thrash metal. You can follow any responses to this entry through the RSS 2.0 feed. You can leave a response, or trackback from your own site.